I was in the Sydney CBD a few weeks ago waiting for my friend. It was Friday afternoon and I was meeting him at the Town Hall so we could look at the shops for an hour before heading home. The streets were busy with a kaleidoscope of humanity – people rushing here and there, students milling around smoking cigarettes, religious people handing out brochures trying to engage the passing crowd. I sat down under a huge jacaranda tree with my book and watched the masses of people move through the final hours of the working week. Finally, I put my head down and started to read, letting the noise and energy fall away as my book sucked me back in. After 10 minutes or so, I look up to meet the eye of a monk who was making his way towards me. He was walking with purpose and there was no mistake he was heading for me. He had a sweet face and a sort of solemn smile and I noticed that his robes were a bit dull and lifeless. He stopped right in front of me and reached for my hand. Now this would freak some people out, but I am one of those easy targets who oozes trust and acceptance. On top of that, I have had some of my most powerful and life changing moments through just allowing a conversation or moment to take place with a random stranger, so I am always curious to see where it goes. The monk placed a bracelet on my wrist, it was one of those beaded bracelets – cheap in nature – but I was moved anyway. I was genuinely touched that he had seen me in the crowd of people and had wanted to give me this gift. I am huge believer in random acts of kindness so I looked deep into his eyes, put my hand on my heart and thanked him for his generosity and thoughtfulness. I told him that he had made my day. The book got pulled out and snapped open. Written on the page were three entries. They included a name, an email address and an amount of money. This was not a gift, this was a transaction! What I was most impressed by was the amount of money that all three people had donated in return for the bracelet: $50 – Wow! Clearly Sydney is a very generous town. So here I found myself at the crossroads of the Law of Reciprocity. The Law of Reciprocity is a universal law, and it is a powerful one at that. 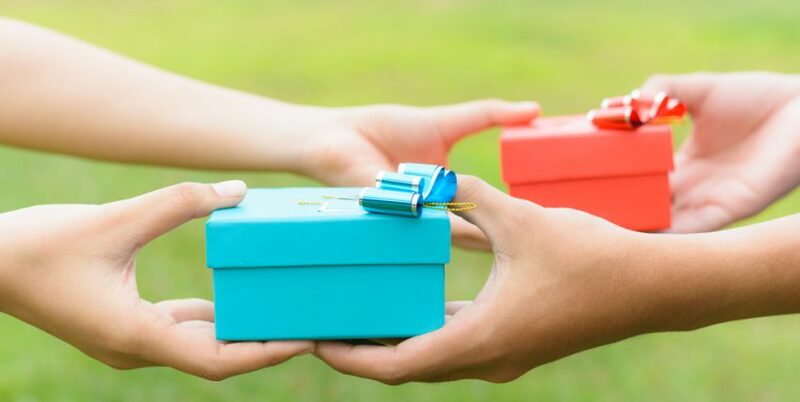 The Law of Reciprocity acknowledges that there is a universal tendency in human beings to repay or reciprocate when given a gift, whether that gift has come in the form of a material object, a generous act or a kind deed. There is a strong drive in people from all cultures to repay gifts or favours with a gift or favour of their own. This impulse expresses itself in reciprocating invitations to parties, Christmas cards, presents, or acts of kindness. If you read last week’s blog, this also the law that the Takers so blatantly disregard. It is a Universal Law that is commonly used by charitable associations. You receive a key-ring or a pack of Christmas cards (or a bracelet on your wrist) in the mail. In return you are asked to make a donation. Depending on how susceptible (or aware) you are to the Law of Reciprocity will depend on how often you run your unconscious programming and fill in the donation slip and send it off. Learning to trust your judgment when it comes to distinguishing acts of true generosity from actions designed to trigger obligatory giving is a process. That process consists of situations where you give back happily as well as those where you give back begrudgingly. Normally there are some instances where you are too trusting and end up feeling used because as much as you gave back, it felt like there was a lack of consent. The serious monk watched me take the bracelet off and hand it back. He wasn’t happy and to be honest, neither was I. I felt silly for confusing a tried and tested donation system for a genuine act of kindness. Even after years of experience as well as an in-depth study of human nature, I am still sucked into the laws that govern us. Robert Cialdini wrote an amazing book called Influence which discusses the six universal principles that form the basis of any great act of persuasion or influence. The Law of Reciprocity is the first principle that is discussed. In Chapter 2, Cialdini shares that every culture on the planet subscribes to the Law of Reciprocity. In fact it’s this “web of indebtedness” which has helped us evolve the way we have as human beings. Before much of the technology of the last century appeared, we had to help each other to simply survive. Like many things in life, the Law of reciprocity is quite neutral, it is the energy that we bring to it that makes it a force for good or a force for manipulation.